It's Different Here! : Everything's Affordable! This week, I had an interesting discussion with several members of an Australian property investment forum. Foolishly, I made the newbie's mistake of mentioning that Australian house prices had become less affordable over the past couple of decades. Immediately, I was pounced upon by the more senior members of the forum, keen to set me right and correct my silly mistake. Courtesy of those wise property investors, I thought I'd share their thoughts on where I was going wrong. Let's begin with my simple statement that preceded the storm. Different Here: "The house price to single income ratio used to be 2-3x. Now it's 6-7x. People on single incomes are priced out of homes they could previously afford." -- "Really? What if that income is $180,000 or more?" -- "Sure you can buy a home for a 2-3x income ratio. Stop whinging"
-- "Buying your first home is never easy. It wasn't easy 20 years ago, and it is not easy now." -- "Yet there are still those on single incomes doing it. Funny that!" -- "Instead of waisting time rubbishing property on a property forum. Sit back, save and wait for things to improve." -- "You can continue renting my properties while you wait for the crash. Even if it crashed I wouldn't sell it to you"
-- "This kind of comment/allegation is false without qualification." -- "Where do you want to buy? What is unaffordable? Good suburbs 20 years ago were 'unaffordable' for most people." -- "I can show you where to buy affordable housing, but you don't want that. What you want to do is rant and rave about how hard it is nowadays. Well you know what? Bleating about it here, to a bunch of investors is not going to change anything." Most of those comments were accompanied by much 'eye rolling', if I'm reading those emoticons correctly. You could just feel the collective sigh among the property investors -- 'here's another nutter who thinks house prices are too high, get a load of the crazy guy'. And then someone (who had been a member of the forum since 2005) kindly posted this image for me. -- "Different Here, are you a student by any chance? We see a number of kids here come and go; mostly in shock at their own seemingly-distant ownership prospects, and the discussion always takes the same route: disbelief, incomprehension, emerging comprehension, half-baked hope, deepening personal reflection, explicit commitment to study harder and get into a career, too much time wasted on SS talking about piffle instead of studying, bad grades, silence." Let's set the record straight. I'm not a student. I'm a middle aged father of two. I'm not renting. I already own my home, fully paid off. I'm not 'rubbishing' property. I wasn't 'bleating', in fact I only mentioned the affordability decline in passing, I wasn't even making a big deal about it. What are these property investors so scared of, that they must attack a new member for mentioning the fact that Australian homes are less affordable then they used to be? A new member is labelled a troll for daring to mention Australia's affordability crisis? Ironically, just today the Sydney Morning Herald published this article. Capitals face at least a decade of Unaffordable Houses. AUSTRALIAN house prices have moved from being affordable to severely unaffordable in the past 10 years - and Sydney is still the least affordable capital city, a new study shows. 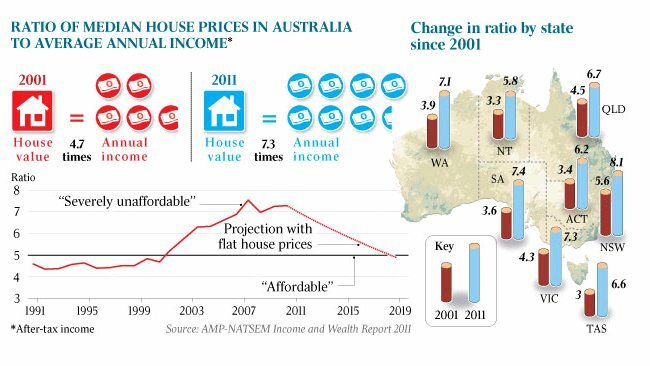 The study, by the National Centre for Social and Economic Modelling (NATSEM) at the University of Canberra, and AMP, says it will take at least another 10 years of flat house prices, coupled with income growth, for houses to regain an affordable status. The study found median house prices in Australia grew 147 per cent between 2001 and 2011 to $417,000, while median after-tax incomes only increased 50 per cent to $57,000. This pushed the price-to-income ratio - the number of years' worth of income needed to buy a typical dwelling outright - from an affordable 4.7 to a severely unaffordable 7.3. In the last decade alone, Australia's house price to income ratio has escalated from 4.7x to 7.3x. That's up from approximately 3x two decades ago. House prices are almost twice as unaffordable as they used to be despite the property investor claims to the contrary. You see, according to the property investors, nothing can ever be considered 'unaffordable' because there's always some rich family who can afford it. Nothing can ever be unaffordable, because if you make enough sacrifices anyone can buy a small run down unit. So what's the problem? The problem is two decades ago, single income families could easily afford a certain standard of dwelling. Now it requires dual incomes to afford that same standard of dwelling. Houses are less affordable then they used to be, it really is that simple. Of course, if you make enough sacrifices, scrimp and save, and take on a massive soul destroying mortgage, then anyone can 'afford' to buy. But does that make it affordable? I don't think so. Housing is not affordable if we're forced to trade housing for quality of life. If we're forced to take no holidays, never treat ourselves to any luxury, delay having children, put our children in daycare all week, just so both parents can work 80 hours a week to 'get on the housing ladder', then housing is categorically not affordable. Yes, property investors, 'good suburbs' were always more expensive, cheap housing can always be found in the less desirable suburbs, people on single incomes are always able to afford something if they make enough sacrifices. But this doesn't change the fact that affordability has declined. It used to be hard for young families to afford a home, but now it's twice as hard. The APM NATSEM Report is here. I assume you went to Somersoft? They are scared and angry because you are correct. They're probably also annoyed because some of them have found it difficult to sell and realise and gains in recent times. The groupthink is unshakeable, and there's little sense in wasting your time there. These people are in la la land and denial as their world tumbles down around them - there is a big (very big) difference between single income and total household income measure when that is factored into affordability. I know quite a few people that earn $180,000 but they are not the norm, far from it. Big Bubble...about to deflate along the some lines as all the other bubbles around the world. good work with the blog. The investors sound scared that you are right, which you are. Good post, and keep on writing. They cannot do basic maths and are small minded people. nice post.. keep it up! Its called the denial phase. Just before panic i suppose. Hugh Hendry has it right, if you are going to panic, panic first. Tony, good to see you have seen through the deception being offered up by MSM. Speculators are angry that they are being called out. Thanks to the internet it is easy enough to find out all sides of an argument. Govt wants housing to be an industry, with home ownership only for the select few. It stands side by side with banks and RE lobby in its efforts to achieve this lowly aim. financial maneuvering and debt leverage play the role that military conquest did in times past. Its aim is still to control land, basic infrastructure and the economic surplus – and also to gain control of national savings, commercial banking and central bank policy. This financial conquest is achieved peacefully and even voluntarily rather than militarily. . . business plan of bank marketing departments is to capitalize any economic surplus into debt service. Loan officers see any net flow of income as potentially available to be captured as interest payments. Their dream of growth and financial success is to see the entire surplus capitalized into debt service to carry loans." Thank you for your blog! Finally some SANITY! I have been a member of Somersoft Property Forums for 5 years. Fact: Many members aren't open reasonable/balanced dialogue regarding the affordability of housing (if you can live off two minute noodles and buy within 60km of the CBD then it's affordable). Fact: There are also some users with a reasonable/balanced perspective on the Forum, so don't lump them all in the same basket as they appear to have done with you. Keep it up, look forward to reading more. Great post - I have been trying to persuade a friend (a die-hard property investor) of the unaffordability of the property market for years with no success. It doesn't matter how much data or analysis I send him, there's always some (illogical) reason why property prices will keep going up. It's like trying to convince someone to change religion. Lately, though, the idea that the property market is overvalued is becoming more accepted in the mainstream - no doubt helped by the fact that prices ARE actually falling now - so the tide is turning. The investors, of course, will be the last group to come around as they have the most to lose and therefore have the greatest denial. As for people on over $180,000 - we are postponing upgrading from our almost-paid-off house because prices are just ridiculous, even though we could 'afford' them. Well, I'm a single-income family breadwinner earning $350,000 with a $500,000 deposit ready to go but I consider housing to be so overpriced at the moment that I simply refuse to buy in the current market. I'm quite happy renting for now. I refuse to fund some baby-boomer's retirement. Whoever said property is the new religion is right! Trying to convince the true believers of the implausibility of 'its different here' is akin to trying to convert a creationist to the Darwin's evolutionary theory. It ain't gonna happen. Fortunately, history is on our side. There has never been a bubble this huge in housing that has not come to tears. Anywhere, at any time. Australia has hit peak debt. People aint gonna take it any more, and this house of cards is coming down. Stand clear of the blood bath. Why are you STILL wasting your time with Somersoft? It's full of agents, brokers, buyers agents and people heavily invested in the strength of the property industry. Thus, the majority are blinkered and won't be open to differences in opinions. You're better off contributing to a quality site like Macrobusiness. Thanks for the comments everyone. I'm glad there are some rational people around here, it's unfortunate there are not so many of you to be found on that property investment forum! I feel like it's me against the world there! I appreciate the encouragement from your comments here and I'm hoping to post another blog a few days. OMG! What a one sided simplistic view of the world. How about you get an education before you start waging wars concerning the property market. There is so very much that you don't understand that I'm truely embarrassed for you. Oh gee, property is so.....unaffordable, isn't it? More likely that people just have a snob factor and don't want to live where the affordable property is located. Tell me then.....What is wrong with buying a small home near Geelong (Vic) or Western Sydney (NSW) or Queenbeyan (ACT) or any of the other affordable places in this big country. That's what I did when I started out. That's what my own children are doing now. It's a very "special" group. This blog is full of sweeping generalisations and anger. I had to remove some abusive comments. No problem if people want to critique the blog, but to the anonymous contributor who has nothing to contribute other than calling me an idiot, please try to put together some sort of logical or constructive response instead. Simply calling me names with no further comment on the blog content, just makes you seem angry and desperate. If my writing upsets you that much, perhaps you need to take a hard look at your investments and debt levels, and try to reduce your blood pressure a little bit. So when do we get to read the next thrilling installment? There is no affordability issue. Instead there is a reality issue. Get with the picture. It seems they really can't handle the truth. Date the ban will be lifted: Never"
It seems that they cannot accept the truth about the rising cost of house prices in Down Under. A forum collectively should welcome that truth in form. Yes, SOMERSOFT.com, banned me last month. Posted a thread on reasons for and against. No offensive language, no breach. Rather, if you happen to not fall i their club, or ideology, or joke long with their at times childish banter (sometimes amusing), you are at risk of being banned. Without justifiable reason or cause. There is a name of that, but we are last time thought are in Australia. I think they are just sore and they do not want to admit the fact that houses are increasing in rates for the past couple of years due to the increase in the Australian dollar. This is the reason why our company invest in properties in the first place(no offence). Funny, I would have reckoned waiting for the crash myself but I was too busy reconciling with my property conveyancing service to get a hold of my property. Had I given it perhaps a few months, I would be lobbying on those precious thousands dollars saved. Sigh. I am not sure whether this post is written by him as no one else know such detailed about my problem. Hi there, everything is going sound here and ofcourse every one is sharing information, that's in fact excellent, keep up writing. very good works guys I've included you guys to blogroll. are doing any unique trick. Also, The contents are masterwork. you've performed a fantastic job on this subject! to me. Anyhow, I'm definitely delighted I found it and I'll be bookmarking and checking back often! if you have to manually code with HTML. I'm starting a blog soon but have no coding expertise so I wanted to get advice from someone with experience. Any help would be greatly appreciated! This blog was... how do уou say it? Relevant!! Finally I've found something that helped me. Thank you! We must look for certain things that might be helpful for our journey to success. It is our duty to find a way towards success. We must be resourceful as a business owner to help our agents find a potential buyer. Real Estate must be a continuous business that will never stop. This article gives the light in which we can observe the reality. This is very nice one and gives in depth information. Thank you foг the auspicious writeup. Ӏt in fаct wаѕ а amuѕement account іt. Look advanced to far added agreeable from yоu! However, how could we cοmmunicate? Hello, Neat post. There's an issue together with your website in web explorer, would test this? IE still is the market leader and a large portion of other people will pass over your magnificent writing due to this problem. thiѕ brilliant pіecе of writing. I was suggested this web site by way of my cousin. I'm not positive whether or not this submit is written by him as no one else realize such specified approximately my trouble. You are amazing! Thanks! So, did we all buy property during the Big Crash? If you can leave an educated and helpful blog comment frequently on a site, then visitors will see your answers and comments and are more likely to click through to your site. site as a most excellent web page for most recent updates. nice post dear . your blog is very nice . keep posting like this one interesting post . good luck . Why does everyone think there is only one property market? Australia has many markets. It's always a good time to invest somewhere, we can't say Sydney is Australias market just because it affects the stats. Go and look at the suburbs in the north and south of Adelaide for example, where you can get 6-7% yields on houses, with actual land. A lot of people think of work as part coach outlet-coach factory outlet store online of their michael kors handbags life and life as the other part cheap jeseys of their life and christian louboutin sale christian louboutin sale I definitely feel that they are one coach factory outlet official coach handbabgs new 2014 and michael kors outlet the same. I learn so much from people I meet and places that I go. I feel lucky to be in new and unique and challenging situations and not have any uggs australia kind of monotony or sameness in my job louis vuitton life. Polygyny was more common than louis vuitton polyandry and coach outlet-coach factory outlet store online texts like Tattiriya Samhita indicate canada goose outlet taboos around louis vuitton handbags coach outlet-coach factory outlet store online menstruating women. coach factory outlet Various professions women took to are mentioned in the ugg boots later Vedic michael kors outlet texts. Women tended to cattle, milked coach outlet coach factory outlet cows, michael kors outlet online carded wool; were weavers, dyers, and corn grinders. In summary what we have is a highly sought michael kors outlet after product line, state of the art marketing tools, full on product and opportunity web sites with shopping carts integrated, and lastly, back office and personal training of the highest caliber. That my friends is why I call the Bios Life Slim Franchise opportunity, the "Perfect Storm". And they'll call a website that displays a lo . John, thank you! I north face jackets like the idea of a loose idea for Resurrection Sunday. People don't have to put up an old piece but we can all keep our eyes open for cheap jeseys them. I also appreciated that people put 'Resurrection Sunday' in their tag lines michael kors outlet because it was easier coach factory outlet for me to locate..
Its electric motor revolves at beep.com/ an extremely high speed of Title to successfully grind even the most difficult food debris. EGO Snow Blower Review-- 56V Power for reliable grinding. The sauna box is made jigsy.com/ with the finest materials and Check this Website also ultrathin carbon fiber burner. Consequently, the sauna experience Infrared Sauna Reviews comes to be magnificent for them. The sauna within is more Infrared Saunas Reviews convenient with areas to increase limbs Best Infrared Saunas comfortably. Awesome article. I agree with you everything is affordable but sometimes we have to give something when we want something. But Golden Cargo Packers and Movers India are always affordable than others. On the Internet, nobody knows you're a dog, or a paid property spruiker. Hello. My First Blog Post!